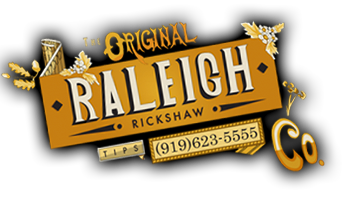 General Transport 1 hr Service Reservation - The Raleigh Rickshaw Co.
Have a nice dinner and a show planned? Coming to Raleigh and want to do something fun? Going club hopping? If you would like to get one (1) of our rickshaws (holds 2 adults) to come and pick you up at a specific time and place, reserve it here to guarantee service.You will have your Rickshaw for up to an hour. Our drivers works for TIPS TOO, Please Tip generously. You may book multiple bikes by entering in a higher quantity below. Please note the quantity is for the number of rickshaws you require, and one rickshaw can only hold 2 occupants. This type of reservation is applicable to Thursday / Friday / Saturday. This is a general "A-to-B" reservation for a one pick -pick hour rickshaw ride, and excludes Weddings, Tours, and other packages.